UTP (“Universal Trading Platform”) is the name for the Euronext market’s central order book system. It operates for all financial instruments listed on Euronext, Euronext Growth and Euronext Access. This order book is the place where buy and sell orders finds equilibrium and where orders are matched against that price. Optiq is a new enhanced, multi-market trading platform, providing customers with maximum flexibility, simplified and harmonized messaging as well as high performance and stability. Optiq will be rolled out across the Euronext markets to replace Euronext UTP in a phased implementation process, starting November 2016. What does “Single Order Book” mean? Single Order Book refers to the fact that all orders related to a specific security are entered and registered into a single order book irrespective of the various listing venues for the security. Each trade in our order book will go into a “straight through process” for clearing and settlement. Euronext’s Single Order Book enhances liquidity, lowers costs, and facilitates access to capital markets by delivering harmonised cross-border trading, clearing and settlement in Europe. The Single Order Book consolidates liquidity (no liquidity fragmentation) in each security to enhance spreads and market depth, and achieve better price formation. In addition, by harmonising Euronext markets, the Single Order Book has made cross-border trading simpler and easier. The Single Order Book designates a single trading line for all securities listed in Europe, and a single trading code for most. As a unique benefit, issuers may choose to list on more than one market to enhance visibility, qualify for inclusion in local indices, or have trading volumes and prices published in the national press, and the Single Order Book will execute their trades on one trading line: the designated Market of Reference (MoR). For example, ING Groep (headquartered in the Netherlands) is listed on two markets, but because its MoR is Euronext Amsterdam, all orders from the other exchange (Belgium) are brought into the Amsterdam market order book. Even though ING Groep orders are not executed there, it is still considered a listed company in Belgium, and must therefore comply with regulations in each market location. However, with the implementation of EU Directives and Regulations most regulatory laws and regulations are harmonised and the additional regulatory implications are limited. What is meant by a trade “outside the central order book” or an OTC trade (“Over The Counter”)? A trade placed “outside the central order book” results from a bilateral agreement between a buyer and a seller who agree on a price for the transaction by taking the prices of transactions on the central market (themselves resulting from multilateral matching on the order book) as a reference. If a trade is “outside the central order book” it is published separately and is clearly identifiable. Depending on the case, this information may be published immediately or at a later date. A block trade, Trading On Exchange or Trading Off Exchange but outside the central order book, is a transaction that is equal to or larger than the “larger than is normal for the market” threshold. This threshold varies depending on whether it involves 24 Frequently Asked Questions equities or bonds, and the trading method (continuous or fixing). From an indices perspective, block trades are counted in the liquidity measurements if they are entered through the Trade Confirmation System (“TCS”) i.e. Trading On Exchange but outside the central order book. Euronext’s TCS system is used for the publication and reporting of transactions made outside a regulated market, in all instruments (equities, ETFs, warrants, certificates and bonds) listed on Euronext and, more generally, for other regulated market trades, such as negotiated deals, and volume weighted average price (VWAP) trades. The “weighted average price” (also known as “trade around”) is a trade at a price within a 1% range (including limits) of the average weighted price. The weighted average price is calculated and defined by Euronext. These trades can only be placed on continuously quoted stocks. Hedging of transactions linked to forward financial instruments is a transaction linking an option and its underlying (equity shares, for example). The price of the underlying must fall within a range set by Euronext. Block trades, weighted average prices and the price authorised as part of a linked transaction are published regularly by Euronext. What does “stock price” mean? This is the setting of a price by matching the best sell offers with the best buy offers. On Euronext market, stocks are traded automatically by the UTP trading platform. Securities are divided into trading groups based on different trading procedures. The composition of these groups, determined on the basis of factors such as the particular characteristics and liquidity of the securities. Securities within the same group are subject to the same timetable and collars parameters. Euronext announces the admission of a financial instrument to trading groups by means of a market notice. For further details, see Euronext Instruction n°4-01 Universal Trading Platform trading manual and related appendices available on our website in section Regulation/Organisation of Trading. How are the trading groups defined? What are the trading methods on the Euronext market? There are two possible trading methods: continuous or double-fixing. A stock is quoted using one of these methods (continuous or double-fixing) depending on its liquidity, i.e. the number of transactions carried out per year. Continuous means that trading happens without any interruption from 9.00 a.m. to 5:30 p.m. for equities. To be traded in continuous mode, the number of trades on a stock should be more than 2,500 per year. Double-fixing, also known as Auction Trading, refers to a trading mode for securities not liquid enough to be traded in continuous. Any orders entered into the Central Order Book are automatically recorded without giving rise to trades. Trading at auction will then happen twice a day. What does “continuous trading” mean? On a continuously operating market, i.e. from 9.00a.m. to 5.35p.m., each new order immediately generates a new price provided there are compatible orders in the opposite direction. If there is no counterparty, the order is recorded and placed in waiting on the order book until its validity expires. What happens in a continuous trading session? Pre-market opening (starting at 7.15a.m. ): orders accumulate on the order book without any transactions taking place. Main trading session (from 9.00a.m. to 5.30p.m. ): the market operates continuously and the introduction of a new order immediately generates one or more transactions as soon as there is/are one or more orders in the opposite direction on the order book. The execution price is that of the limit of the corresponding order on the order book. Pre-Closing phase (from 5.30p.m. to 5.35p.m. ): as in pre-market opening, orders accumulate but with no transactions. Closing Auction: The closing prices for continuously-traded securities are determined by the price set at the Closing Auction. If no price is issued at the Closing Auction, the closing price is the last-traded price during the main trading session. Trading-at-last Phase (from 5.35p.m. to 5.40p.m. ): During the trading-at-last phase, orders only can be entered and matched at the closing price and only at that price. Unlike continuous trading, a fixing trading provides a transaction that generates a price at a set time twice each day (11.30a.m. and 4.30p.m.). The “Auction” is a method for calculating stock prices. After a period during which orders are accumulated on the order book without any transactions taking place, our system (UTP) makes a comparison of the accumulated orders. For each price limit recorded on the order book, the system adds together the cumulative quantities in each Buy and Sell column. The system then compares the total of each column in order to determine the limit that would allow the largest number of stocks to be traded. This limit then becomes the stock’s price and all the stocks included in the total are immediately traded at this price. What happens during the Auction trading phase? During the auction trading phase, buy and sell orders are accumulated and are all matched together twice a day, at set times, on the same principle as at the market opening or closure with continuous trading. The pre-opening phase starts at 7.15am. How can my company change from “Auction” trading to “Continuous” trading on Euronext or Euronext Growth? For continuous trading, the issuer must carry out 2,500 trades of the stock per year. Once a year (in the first quarter) Euronext reviews each stock’s transaction volume during the previous financial year. Euronext then invites those stocks quoted on fixing that has been traded more than 2,500 times during the previous financial year to switch to continuous trading. For those stocks on continuous trading that have been traded less than 2,500 times during the previous financial year, the reverse applies. To keep the continuous trading method with less than 2,500 transactions per year, listed companies must conclude an agreement with a Liquidity Provider. The Liquidity Provider is appointed by the issuer and has to sign a Liquidity Provision Agreement with the Relevant Euronext Market Undertaking. The Liquidity Provider will be admitted if it commits to a specific size and spread, provided that such size and spread will in Euronext’s opinion have added value for the liquidity and the quality of the market of a security. When considering the possible added value of a Liquidity Provider, Euronext will take into account the current sizes and spreads in the Central Order Book; if such information is not available, e.g. in case of an IPO, the added value will be considered on the basis of sizes and spreads of similar companies. In case of a dual listed instrument, Euronext may also use the sizes and spreads of the other market. “Reservation” refers to the situation where it is temporarily impossible to match offer with demand within the authorised price ranges. The price range is defined around the reference price. It is stipulated for each security and defines the maximum deviation (symmetrically positive and negative) from the reference price. All price ranges, defined on a trading group basis, are displayed in the Appendix to the Euronext Trading Manual. Price ranges may differ between the auction and the continuous phases. the reference price can result from an external feed of benchmark prices aimed at giving an indication of the theoretical value of the security. Euronext temporarily interrupts the trading of a security if a buy or sell order, if it went ahead, would result in trades at (a) price(s) above or below the limits known as “reservation thresholds”. Reservation thresholds are established by applying a maximum fluctuation percentage to a price known as the “reference price” corresponding to the last price traded (usually the previous day’s closing price) at the opening of a session, or at the last indicative price published. The reservation time varies depending on which trading group the security belongs to. More information can be found in the Appendix to Instruction n° 4-01 the Universal Trading Platform Trading manual available on our website in section Regulation/Organisation of Trading. Please also refer to the Volatility Interruption Schedule in the column that is called “Auto”. What does “halt in trading” mean? A “halt in trading”, also called Trading Suspension, follows from a decision by the local regulator, by the company itself following a major event such as a restructuring, acquisition, market announcement, planned finance transaction etc., or sometimes a decision by Euronext. the date and terms and conditions for trading resumption (failing this the announcement states that the stock remains suspended until a new announcement is made). When a halt is activated at the request of the listed company, this must be followed by an announcement published or disseminated by the company itself and a market notice issued by Euronext. What is a trading suspension ? Although law firms can act on behalf of the company the actual request can be sent by the company alone and only by Responsible Persons within the company (CEO, CFO or Head of IR). Euronext reserves the right to carry out any identification checks it deems necessary. As trading on our markets is overseen by our regulators all suspensions will require close collaboration and sometimes even the approval of the regulator. Suspensions in the Amsterdam market can only be requested by the Regulator. They will contact Euronext’s EMS department directly. What is a “Liquidity Provider”? A Liquidity Provider, or Market Maker, is a broker and trading member of Euronext. The Liquidity Provider undertakes to take simultaneous buy and sell positions with a minimum quantity (in terms of number of stocks or capital) and a maximum price range (usually set as a percentage) known as the spread. (for example, for X’s securities, the minimum quantity may be set at €5.000 and the maximum spread at 5%). It is thus able to neutralise swings in volatility in the market and guarantee transactions at any time (so that each buyer / seller can find a counterparty at any time), and even increase volumes. The Liquidity Provider acts as a genuine “market specialist” for a stock and is often the first point of contact for the issuing company. What is a Liquidity Provider’s agreement? To improve stock liquidity, Euronext has put in place Liquidity Providers’ agreements. A Liquidity Provider’s agreement is an agreement entered into between Euronext and a market member (the broker), which guarantees a permanent price range to the listed company, i.e. a buy order and a sell order on the order book. In Belgium and in France, the Liquidity Provider is also linked to a liquidity agreement with the issuer. Liquidity Providers’ performance is monitored by Euronext’s “Cash Market Quality” division whose role consists of managing Liquidity Providers’ agreements and monitoring their performance and commitments. Every month, Euronext sends information to Liquidity Providers and Issuers concerned through Connect, the secure website for listed companies. What is the “Deferred Settlement Service” (“Service à Réglement Différé” in French - SRD)? 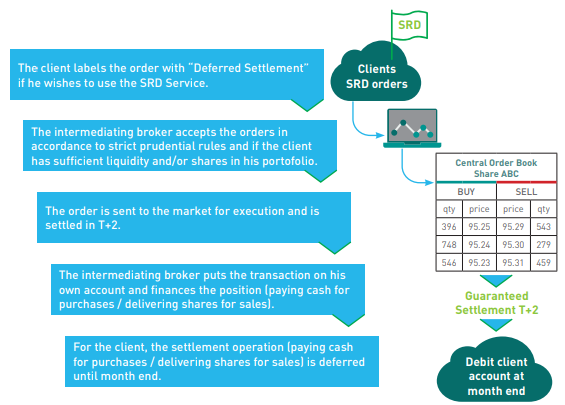 The Deferred Settlement Service (SRD) is a mechanism that allows investors to take long or short leveraged positions and is mainly used by private investors as an alternative to margin accounts. The investor identifies his order as being SRD when passing it to his financial intermediary and the order is then immediately routed to the Regulated Market, where it is executed and settled in a standard three-day time period. The intermediary finances his client’s position until the end of the month, when the investor receives the balance of his positions in his account. The leverage is the result of the cover ratio the investor has to put toward his position at the time of execution. The ratio varies from 20 percent to 40 percent, depending on the collateral used. Securities eligible for the “long-only” Deferred Settlement Service must have an average daily turnover of at least €100,000. What is the “liquidation day”? Participants who are unable or unwilling to close out their positions have the option of asking their broker to extend their positions until the following liquidation day.